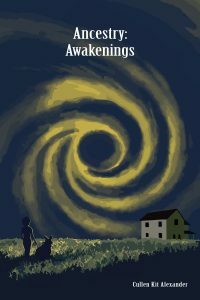 Magic, passed down from generation to generation through three different families from an extinct tribe, is now at the doorsteps of an unsuspecting family. Danger lurks everywhere as an evil tribal chief, Nuabani, banished to the dark abyss, seeks revenge against those who stripped him of his magic centuries ago. Since the time of banishment, Nuabani has aligned himself with others who will stop at nothing to return all the magic back to him, even if it includes harming or killing innocents. One person stands in his way – one of the descendants of the tribe who wields the magic known as a Magica. Unfortunately, time is running out for the Magica who must pass her magic to a descendant whose own abilities must be awakened. Unknowingly caught in the middle is Dr. Logan Tompkins, a renowned child/adolescent psychiatrist, who is trying to raise three children after recently losing his wife. Soon after his wife dies, Logan’s daughter Emma begins experiencing nightmares that eventually manifest into psychotic-like behaviors. Hoping to find answers to help his daughter, he moves his family to Virginia. There he discovers that it is not just his daughter with unexplainable psychotic behaviors, but there are several other children admitted to the psychiatric hospital where he works that experienced the same sudden onset of symptoms. Like Emma, none of them have a history of psychosis or predisposing conditions that would explain their behaviors. As Dr. Tompkins digs into his own family’s past to save Emma, he will come face to face with his connection to Nuabani and the Magica. Will Dr. Tompkins find the answers he seeks and strength to save his daughter, the other children, and embrace his ancestry? Can the Magica save the world and find the next descendant before it’s too late?